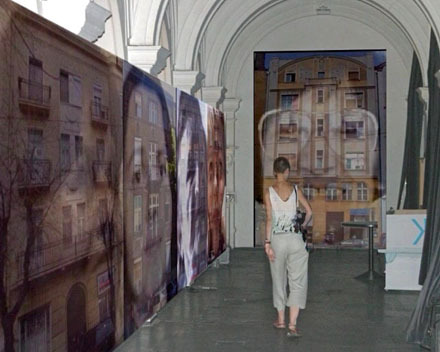 INFACES is originally a video work which interprets the connection between faces of people and faces of buildings built in Belgrade between World Wars in the Modern spirit. According to the past-times idea of women symbolising the house, home, the pillar of the family, these buildings are animated to take part in this point of view. They talk, laugh and stare at the visitor. The conception of the setup is based on the acoustical experience of closed spaces. The feeling of space will be created by reproduction of the real-time processed sound signal. The visitors fill in the data-base of sounds. The setup behaves in such a way that uses the content of recording to a redundant extent, connecting peaces of conversations into a musical peace. The musical structure which is established by moving through this space is a composition that behaves differently in the time of every visitor. This kind of interactivity of work activates the presence of the visitors as the triggering element of the system. The participation of public in every staged event is something that is never considered important enough, it is a more or less disturbing background noise that tells about imperfection of the stage situation. Even though a performance is perfectly conducted there are always these unexpected small noises produced by the listeners it is actually played for. On the bases of that, Selena Savic wants to have a “perfect performance” done by the visitors themselves. Selena Savic is an architect and sound-artist. She lives and works in The Hague, The Netherlands where she is completing her master studies in ArtScience. She has a background in urban planning, working in the Research Centre on the Faculty of Architecture in Belgrade, Serbia. She works mostly with sound and installations. She connects abstracting parts of reality into systems of related elements, often resulting with absurd experiences.